VENICE, Italy -- Richard Ousby, a 29-year-old sous chef from Sydney, Australia, has been named the 2012 Acqua Panna & S. Pellegrino Young Chef of the Year. The prestigious award -- from the brands behind the World's 50 Best Restaurants -- was presented in concurrence with the 12th S. Pellegrino Cooking Cup, a rigorous two-day culinary competition among 10 emerging international talents. The two-part competition began as Ousby and nine other accomplished chefs -- all under 30 years old -- prepared a signature dish for a celebrity jury at a banquet dinner at the Hilton Molino Stucky Venice. On the second day, the S. Pellegrino Cooking Cup -- a culinary cross between The Amazing Race and Top Chef -- took place. Ousby and his competitors, armed with challenging list of required ingredients, battled against time and stormy weather while cooking in the galley of a racing sailboat. With an unprecedented win, Richard Ousby swept the entire competition taking home the top three honors, including the S. Pellegrino Cooking Cup Trophy, the Inside the Cooking Award and the title of 2012 Young Chef of the Year. Signature Dish: lardo and prawn dumpling, shaved asparagus, local clams and summer herbs. Cooking Cup Dish: charred mackerel with garlic custard, roasted onions and split peas served with a rice-infused tea. So what does it take to be the world's best young chef? I sat down with Richard to discuss his winning strategy and what it's like to cook on a speeding sailboat. We began by discussing the "Mystery Basket" list of ingredients revealed to the competitors just two days prior to the sailing portion of the Cooking Cup. So, what went through your mind when they revealed the list of ingredients? I shat myself. (He laughs.) Actually...I was really confronted at first, and I thought, "Oh God, what am I going to do with these things?" It required a lot of sitting back, trying to work out what I've done with these ingredients in the past, what I've seen (other) people do with them, what exists out there with them...and just a little bit of calm thinking. What about the difficulty of rice as a required ingredient? Rice was probably the hardest ingredient out of the list. It was a very good idea; it separated the boys from the men. "How do I make it special so I stand out from other people?" was my thought process. You had to think outside the box to get something out of it. With a limited time. Exactly. I couldn't distill it, or turn it into sake. Had you ever cooked on a boat before? No. I hadn't (he laughs). It was a very new experience. It was such a little kitchen, and everything has to be put away, otherwise it's just going to fall everywhere and you're going to lose everything. So, did anything hit the floor? Pots, pans...there were pots on the floor. But no food! No food went onto the floor. I can imagine it was pretty rough out there. I had one leg pushed up against a cupboard, and the other leg kind of jammed in the back of this doorframe, just so I could maintain my stability while doing things. I think you could call it a clamping-cooking sort of method. Was this your first trip to Venice? Yes, it was so beautiful. I arrived a few days early. Coming from the other side of the world, I didn't want to be jetlagged. An Italian friend of mine organized a little apartment above the Rialto markets, so I stayed there and drank Spritz in the afternoon and walked around the market in the mornings. My dream is turning a small piece of land a friend of mine (in Australia) owns into a restaurant with organic, natural ethics, producing fruit and vegetables, maybe some animals ... really different and amazing, with a little bit of Japanese influence, a style that I've slowly developed and still am developing. Who are some chefs you admire? Philosophy-wise, I admire Peter Gilmore, my ex-boss at Quay. He's amazing. I often wonder if I'll ever be able to think about food the way he does. It's very interesting to see him say, "Okay, I've got this and this," and see the things he does with food. I'm also inspired by David Chang, I love his style, his coolness, having fun, having a few drinks...and Massimo Battura. I love his particular style and his stories. I've always, since I was a kid, said I was going to be a chef. Not that anyone pushed me to do it. I don't know at what point in the thought process it came to me, but I decided, "Yeah, I just love cooking." I never had a choice in my mind. That's what I was going to do. Richard Ousby recently wrapped up three years as a sous chef at Quay Restaurant in Sydney, Australia (currently ranked No. 29, The World's 50 Best). 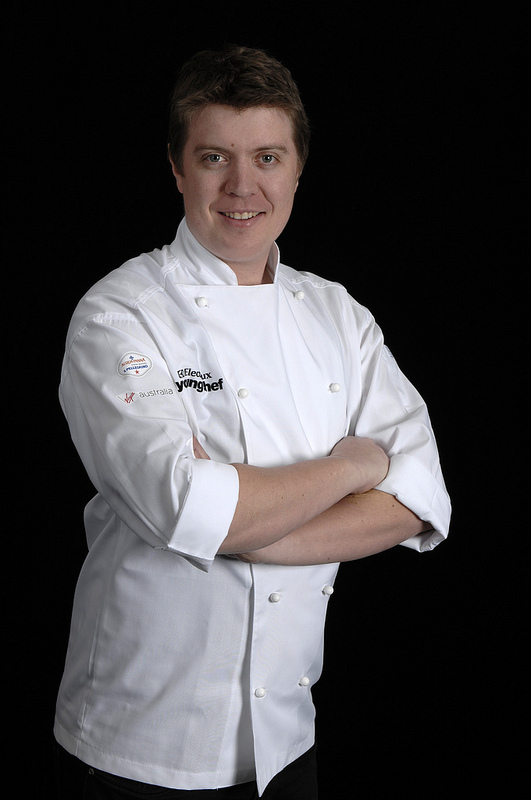 Last year he was named Australia's 2011 Electrolux Young Chef of the Year. He plans to spend the next few weeks traveling and tasting his way through Europe, celebrating his new culinary status and "awaiting the next part of the journey."